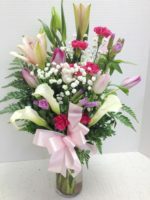 We design this fun, festive spring floral basket with the freshest carnations, lilies, stock or statice and godetia (when available). 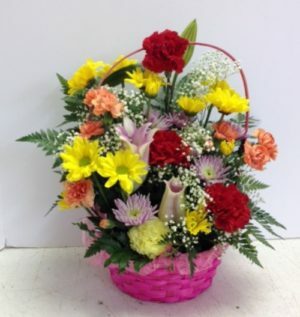 Then we choose a basket that’s pretty to match (might be pink or yellow or green or white). Then we’ll make it extra special for that extra special person in your life! You know it’s spring when the flowers start to POP up from the ground. Usually my Calla Lilies are the first to show (I take care of them all year ’round) and then WHOLA! It’s spring! We see tulips and godetia and daisies. The lilies take on a life of their own! The carnations arrive in soft, spring colors. 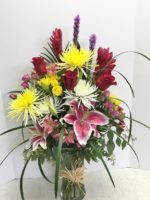 Count on Roadrunner Florist for a unique, pretty spring basket of flowers! Looking for other options? 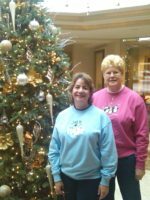 Try our Fun Flowers or Sensational Susan.